Over the last few months I have been so horridly busy, both at work and at home looking after my three children, that I have barely had enough time to sleep, let alone sketch. So I have set myself an Easter Resolution of doing more art work, initially in my sketchbooks and later moving onto boards or canvas. 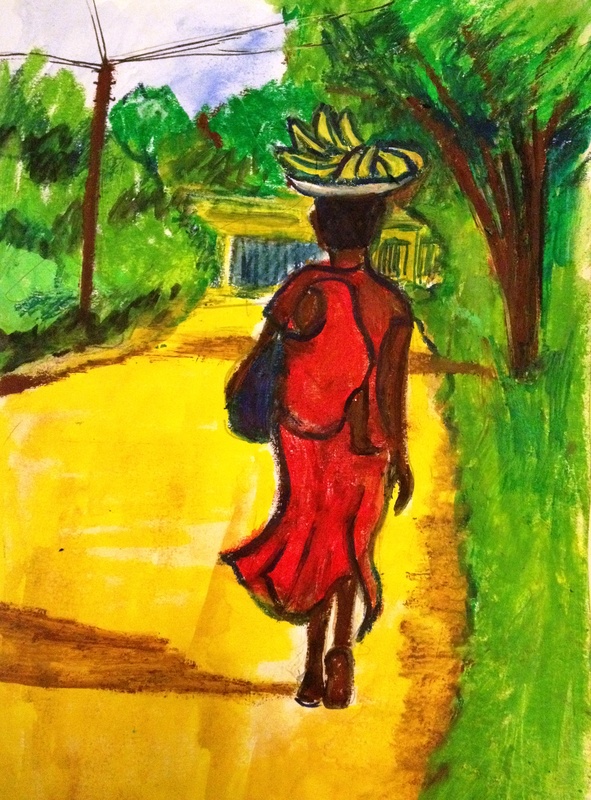 Here is my first attempt; it is done in oil pastels and acrylic and is of a woman carrying her baby and a bowl of bananas, on her way home from market in the Isamilo district of Mwanza, Tanzania. Coming home from market in Mwanza, Tanzania. I support a little girl in Tanzania. Love your sketch! I am glad you like it. It really is a wonderful place. In addition to teaching at an international school in Mwanza, I also volunteer to teach at a Saturday school, where we teach street children and orphans – I love it and the children are wonderful. Just SO Africa to me. And she’s probably singing too. Mass African singing is truly wonderful. I’m sure you’ve heard them by now. So pleased you had such a ‘successful’ safari. All these images will stay with you, they, to me, are so powerful.